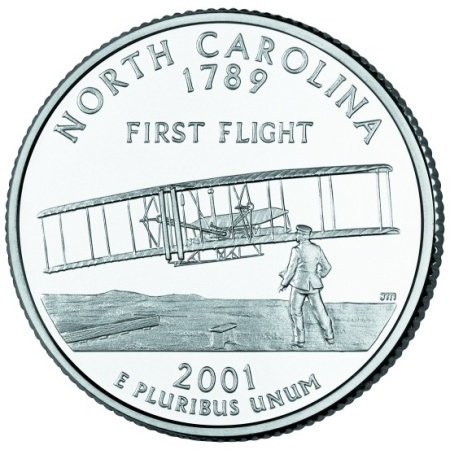 The North Carolina State Quarter was the second state quarter issued in 2001 and the 12th in the series which was authorized by the 50 States Commemorative Coin Program Act. 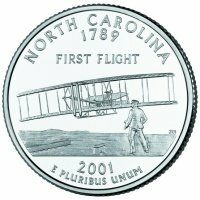 The release date for the NC State Quarter was March 12, 2001 and the theme chosen for the design was First Flight. The elements of the design highlight the famous 1903 photograph of the "First Flight" taken at Kitty Hawk on December 17, 1903 as Orville Wright makes history with the first successful "flight of a heavier-than-air, self-propelled flying machine". His older brother, Wilbur is standing in the foreground. Orville successfully flew the "Flyer" 120 feet in 12 seconds, earning his place in the history books. The North Carolina Department of Cultural Resources was appointed by Governor James B. Hunt to head up the process of choosing the state's design concept. The Department then formed the North Carolina Commemorative Coin Committee, consisting of their members, as well as members of the Division of Archives and History and coin collectors. Residents of North Carolina were encouraged to submit design ideas to the Committee. The design ideas were narrowed down to three which were submitted to Governor Hunt on June 5, 2000. Governor Hunt, along with the Committee, selected the "First Flight" theme as the official design. Below is a table showing the design specifications and mintages of the North Carolina State Quarter. Note: The modification moved some of the wording from the reverse to the obverse to leave the reverse available for the state's design. Reverse - Each state theme was proposed, and approved, by the governor of the state. Final design was created by John Mercanti. His initials are on the right side just above the 'ground'.